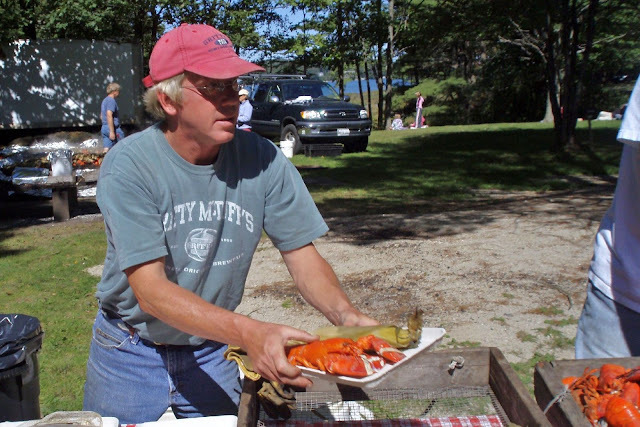 Here are photos I took while competing in the 2009 Lobsterman Triathlon in Freeport, Maine. This Olympic-distance Tri starts with an open-water swim of 1.5K (just under one mile)...followed by a 25-mile bike ride...and finishes with a 10K run. I swam. In each of the past four years I completed at least one Olympic-distance Tri as an individual competitor, but this year fellow Mystic Runners Jeff Mader and Bob Lane joined me so we could enter Lobsterman as a relay team. I swam, Jeff rode his bike, and Bob ran. I had heard that Lobsterman is one of the most beautiful Triathlons in the country...but that did not prepare me for the exquisite course and the perfect day. Apparently it rained last year and the year before, but we were lucky. On this day the water, the sky, even the air...sparkled.